The phytools page is having problems again. This is a UMass-Boston server-wide issue, so there is not much I can do about it unfortunately (aside from complain to the system administrator). To make all the recent updates to the phytools package available to all users, however, I have just submitted a new version of phytools to CRAN. Hopefully this version is accepted and made available via the CRAN mirrors as well as in binary form soon. 1. A new function to add a legend to a plotted stochastic map tree (add.simmap.legend). 2. A new version of plotSimmap that sets the environmental variable "lastplot.phylo" to be compatible with ape functions nodelabels, tiplabels, and edgelabels. 3. A new version of findMRCA that can also (optionally) return the height above the root of the MRCA of a pair of taxa. 4. A robust Newick tree reader that can handle singleton nodes, if present. 5. A bug fix in brownieREML. 6. A new function (collapse.to.star) that collapses specified subtrees into a star tree, while retaining the same total height above the root for each tip. 7. 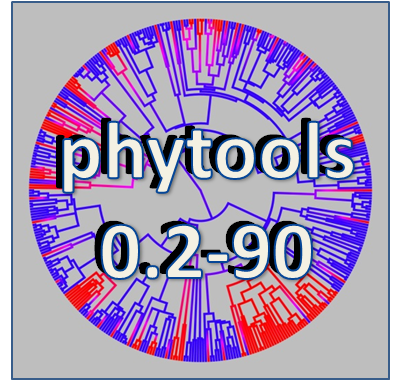 New versions of the phytools 3D functions phylomorphospace3d and fancyTree(...,type="traitgram3d") that work a little better with the functions of rgl (described here). 8. User control of tip & internal node sizes in phylomorphospace..
9. A hacky work-around fix for the problem of attaching a new tip separated from an existing tip by zero lenth using bind.tip. 10. Finally, today, a fix to the broken function evol.vcv, which is the function implementing the method of Revell & Collar (2009). Hopefully this new phytools update is accepted and posted to CRAN soon.